The Dream Warrior: Do you dare look into the crystal ball? Do you dare look into the crystal ball? 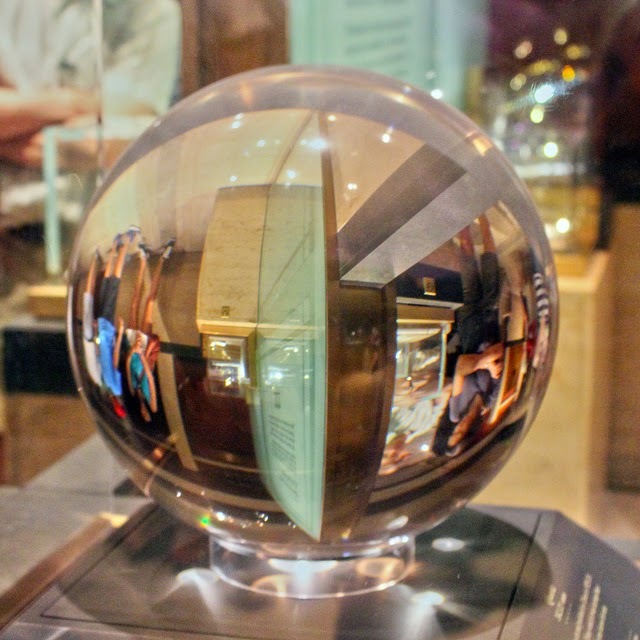 The fist time I saw the crystal ball in the Hall of Gems and Minerals at the Smithsonian Institution when I was 11 years old, I was stunned. I walked around the corner and there it was: 106.75 lbs. (48.5 kg), and 12.9 inches (32.7 cm) in diameter; pure, flawless, natural quartz. I couldn't take my eyes off it. I circled it, fascinated by it. It was at least a half hour before I could tear myself away. Of all the things I saw in the three days I spent on the National Mall that summer, the giant crystal made the biggest impression on me. Part of it was the sublime, pure beauty of the object itself. Part of it was what the object represented: vision! I endeavored to acquire one myself, which wasn't all that easy in a small town in West Virginia in 1972 (no internet e-stores, you know), and the first one I got was acrylic. Not quite the same. Finally, while I was living in California, I found a real quartz crystal ball in a mineral shop somewhere up in the Marble Mountains. It was a pygmy compared to the Smithsonian's crystal, at about six centimeters across. And I've acquired other crystals since. It's kind of a fetish. Learning to see anything in a crystal is hard work, and requires lots of practice. Frankly, I still haven't had that much success with it. But I'll keep trying. That eleven-year-old boy inside me is still fascinated, and I think of the mother-of-all-crystal-balls that riveted me all those years ago every time I see a crystal. But vision comes in many ways. Like it did on that morning in the late winter of 2004. I wrote down a dream after I woke up, and didn't particularly notice it was anything unusual. In the dream, an old friend of mine runs into me inside the MTI building. (the Hungarian Press Agency, where I worked for ten years). She tells me she needs to take another job, and I would be the perfect replacement for her. It would be in a different division of MTI and it would give me more responsibilities than my current job. I get excited. New possibilities! After I'd thought I was in a dead-end job. The next day I was walking down the hall at MTI when I ran into an editor from another division in MTI; someone I only knew casually, and barely at that. She whispered to me conspiratorially to come into her office for a minute. After she shut the door she explained that she had been given the authority to set up a new English-language news service within MTI, but one that would be run more along the lines of a Western wire service. She was looking for intelligent, independent-minded native-speaking editors for her staff. She had immediately thought of me. "So... you're offering me a new job inside of MTI?" When I went home that evening, I told my wife what had happened that day. When I was finished, I pointed to the desk and said, "My dream journal's been sitting there on the desk since I wrote in it this morning, right"? "Go read the last entry." She did. When she was finished, she looked up at me with her jaw hanging open. So, I got my crystal vision after all, even without the ball. The important thing is that I took that peak into the future as a signal from my inner self (my genius, my daemon, my soul, whatever you want to call it) to pay attention when this moment arrived. I was scared by the job she offered me. There were things about it I knew would be a real stretch of my skills. But because I'd had the dream, I felt I was being advised to be brave. I said yes. And saying yes set off a chain of events that led me to more challenging and life expanding situations. A number of people who have heard this story try to explain it "rationally": I'd heard conversations in the hall subconsciously; my subconscious had made certain logical leaps and figured out what was going to happen. Yadda, yadda, yadda. I just shake my head at their desperate need to deny what was obvious to me. I had seen the future in my dream. And accepting the dream's inner counsel lit a spark that ignited the flame of transformation in my life. It also brought me some hard tests. I think one of the main reasons people don't remember their dream is because dreams have the power to accelerate change in your life. It can be scary. Wow. I feel like the story made me speechless. I believe every single word of it, and do believe such dreams can happen. Yet sill the power of your mystical experience leaves me open-mouthed. "Accepting the dream's inner counsel lit a spark that ignited the flame of transformation in my life." This is so poetic, true-life, profound and inspiring at the same time. I wonder if we can develop a conscious ability to talk to our dream's inner counsels - and understand what we are told. Thank you for sharing Theo.